People in Europe, Australia, New Zealand, and the Middle East can send in pledges through Kickstarter starting today. 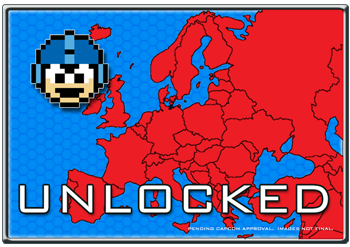 Beginning today at 14:00 GMT, potential players of the official Mega Man board game can send in pledges to Kickstarter from Europe, Australia, New Zealand, and the Middle East. Early bird pledge levels will be available to these new pledgers because they were not able to pledge when the Kickstarter campaign began. The early bird pledge levels end tomorrow at 14:00 GMT. The Mega Man board game is Capcom-licensed and produced by Jasco Games. Part side scroller and part board game, two to eight players race to beat Dr. Wily. The Kickstarter campaign was a success in just one day, reaching twice its $70,000 in that time. The campaign is underway still and has passed $250,000. The next stretch goal at $275,000 will add Roll as an additional piece. A licensing agreement between Jasco Games and Capcom initially limited the game to be sold in North America, but Capcom has since revised its agreement to include Europe, Australia, New Zealand, and the Middle East to spread around the Mega Man love. Before the game began its campaign on Kickstarter, Jasco expected to finish the game regardless of Kickstarter success. The Kickstarter exists to give fans a chance to "show their support and help us make the game better." Estimated delivery is currently set for October 2014. With the early bird pledge levels, it costs $60 (plus international shipping) to back the campaign and receive the board game.